A bunion (from Latin meaning enlargement) is a fairly common and unsightly deformity. It occurs when a protrusion of bone develops on the side of the joint in the big toe. As this protrusion becomes larger and more painful, inflammation and redness may develop. The big toe progressively turns outward as the disorder becomes more severe. The enlargement occurs either at the base of the great toe or on the outside of the foot, at the base of the little toe where it is called a "tailor’s bunion." Bunions may also appear with other deformities such as hammertoes and metatarsal problems. A bunion is most often a symptom of faulty mechanics of the foot. People with flat feet or low arches are more prone to develop the problem than those with higher arches. Bunions also may be associated with arthritis. Arthritis can cause the joints’ protective covering - cartilage to deteriorate, leaving the joint damaged with a decreased range of motion. Contrary to public opinion, bunions are not caused by improper shoes but by a combination of heredity and structural problems such as flat feet. Many patients with this condition tell us that other family members have had similar problems. Some bunions may be temporarily treated non-surgically with injections, special shoes or shoe aids which may ease the symptoms but will not reduce the deformity. Surgical treatment may be performed at a surgical center (in and out on the same day) or with a brief hospital stay. The correction involves removal of the enlarged portion of the bone and realignment of the big toe ( this is usually accomplished by the performance of an osteotomy--cutting and repositioning of the bone), often under local anesthesia (some patients may require or prefer general anesthesia). What types of surgeries are there? Many surgical procedures are used to correct bunions. The decision to employ a procedure is based on the severity of the deformity, the patient’s age, the general health of the patient, their activity level, and the general health of the bones and connective tissue. Other factors may influence the choice of a procedure used. The general guidelines for types of surgery are: Mild Bunion, Moderate Bunion, Severe Bunion, and Arthritic Bunion or big toe joint. For a Mild Bunion, the foot surgeon may remove the enlarged portion of bone and realign the muscles, tendons and ligaments surrounding the joint-today this procedure is mostly combined with other procedures. 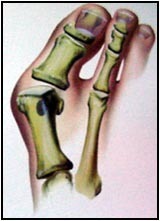 For a Moderate Bunion, the surgeon may cut the bone (osteotomy) and shift it to its proper position. Whether or not the bone is cut depends on the severity and location of the deformity. In addition, the surrounding tendons and ligaments may need to be repositioned. This is probably the most common surgical procedure for bunion deformity. For a Severe Bunion, a combination of the following procedures may be necessary: removal of the enlarged portion of the bone; cutting and realignment of the bone; and correction of the tendons and ligaments. If the joint is destroyed beyond repair (commonly seen in arthritis), it may need to be reconstructed or replaced with an artificial joint. Joint replacement implants may be used in the reconstruction of the big toe joint. Other methods at this point include fusion of the joint-arthrodesis procedures. Some risks when considering surgery include infection, joint stiffness, malalignment, joint pain, scar formation and recurrence. The ultimate goal is to relieve pain, correct the deformity, and prevent the bunion from recurring. It is important for the patient to realize that these complications are rare, yet possible. Most patients experience discomfort during the first 48 hours after surgery for which pain medication is prescribed. In as soon as one day, many patients will be able to bear some weight on their foot. Sometimes, a specific walking aid such as a cast or wooden shoe may be used. Also, for a period of time, the joint may remain slightly stiff and not be as flexible as before the surgery--this is quite common. Gradual return to normal activity will be recommended by the podiatric surgeon as healing progresses.